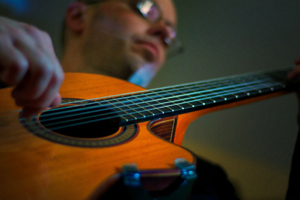 Geoff Valentine plays solo classical, folk/traditional, jazz, contemporary, and popular music on guitar - perfect for weddings, receptions, cocktail hours, and other events. He is an experienced performer who can add just the right ambience to corporate functions, upscale restaurants, wine bars, and other venues. "The expertise and determination with which you play make the acoustic guitar sound extraordinary." Geoff is an active recitalist who has performed numerous concerts and recitals in the New England area. He regularly performs on a volunteer basis for residents in assisted living facilities and nursing homes. Geoff is an avid musical collaborator. He has chamber music experience performing in a variety of mixed ensembles. In addition, he is an accomplished electric guitarist and bassist playing across a wide range of styles and genres. Located in the Boston area, Geoff is willing to travel to venues throughout New England. For more booking information or other questions, please see the contact page.